Florida, Indiana, Louisville and Ohio State make the cut for Final Four. President Barack Obama has predicted that Louisville, Indiana, Ohio State and Florida will reach the Final Four in this year's NCAA tournament. 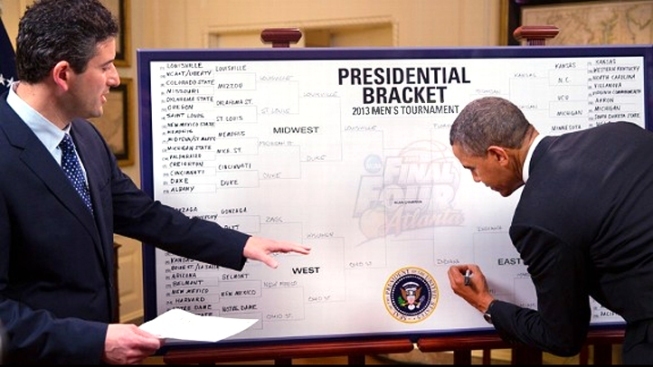 President Barack Obama is picking Florida, Indiana, Louisville, Ohio State to reach the Final Four. And after a championship match-up between No. 1 seeds Indiana and Louisville, Obama has given the Hoosiers the edge at the NCAA basketball tournament. "I think this is Indiana’s year," Obama said in unveiling his bracket on ESPN. The president has filled out a bracket for ESPN for five years straight. On the women's side, Obama selected Baylor, California, UConn and Notre Dame to advance to New Orleans. Baylor, UConn and Notre Dame are all No. 1 seeds and California is a No. 2 seed. In 2012, President Obama's men's bracket ranked 2,347,421 out of 6.45 million entries, placing him in the 63.6th percentile.